Do u know wats this appu army???? Here u could see a poster displaying the launch of the appu army....there were buzzing wit their music.... Their red coloured T-shirts made them stand out and were joined by their friends in hay-coloured sombrero-hats. They kept playing the distinctive bayla tune that lets you know the Sri Lankans are around. 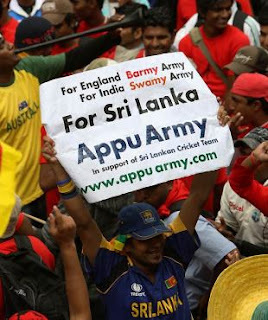 The Appu Army was in full swing and lent a carnival-like atmosphere as they marched up and down the main drag behind the Don Bradman stand inside the ground. The horns and the whistles kept blowing, so did the conch shells and the hand bells. So festive was the atmosphere that it was difficult for the Indians not to soak it in.